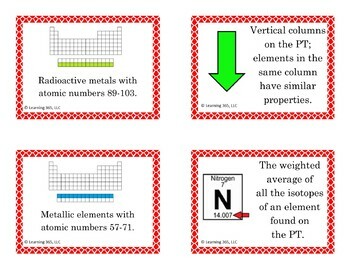 Use these Periodic Table Flash Cards to review the arrangement of the periodic table. Print them on cardstock, laminate for durability, and they are ready to use. 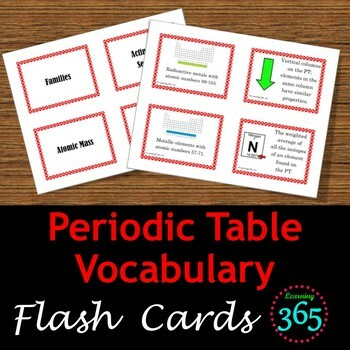 This Periodic Table Flash Cards Set includes 20 flash cards with vocabulary necessary for students to understand the arrangement of the periodic table. Each card includes a picture and definition on one side with the vocabulary term on the other side. Cards are printed 4 to a page and will need to be printed front and back. 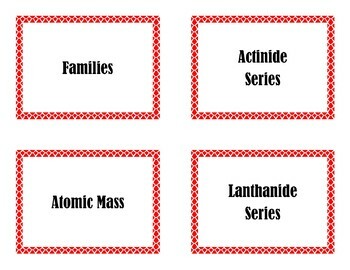 The cards are also color coded to match our Periodic Table Interactive Word. Stay connected with Learning 365. Be sure to follow our TpT store by clicking on the “Follow Me” next to our logo to receive notifications of new products and upcoming sales. We are always trying to improve. Please contact us via "Ask a Question" and let us know how we can improve our products before leaving feedback. © Learning 365, LLC. All rights reserved by author. The purchaser of this product may use this product for single, individual classroom use only. This license is not intended for use by organizations or multiple users including but not limited to school districts, schools, or multiple teachers. No part of this publication may be reproduced, distributed, or transmitted in any form or by any means without express written permission from the author. This includes posting this product on the internet in any form including classroom/personal websites or network drives. Violations are subject to the penalties of the Digital Millennium Copyright Act.